Preheat the oven to 180°C/fan 160°C/ gas 4, and line a 12-hole muffin tray with paper cases. Cream the butter in a large bowl or electric food mixer. Add the sugar and beat until light and fluffy. Whisk the eggs with the rose water for a few seconds, then gradually add to the butter mixture, beating all the time. Next beat in the buttermilk, then sift in the flour and fold in gently to combine. Divide the mixture between the cases, filling each three-quarters full, then bake for 20-25 minutes or until golden. Leave for 5 minutes before removing from the tin and cooling on a wire rack. To make the icing, mix the icing sugar and rose water with 1 tablespoon of water until thick, adding a tiny extra splash of rose water or water if too thick to spread. 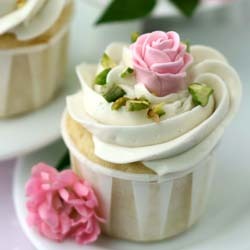 Spread the icing using the back of a teaspoon or with a palette knife dipped into hot water and sprinkle with the chopped pistachios. Transfer to a serving plate and scatter with crystallized rose petals to finish. Use a small paintbrush to brush the petals with just enough lightly whisked egg white to cover the surface. Sprinkle with caster sugar, then gently shake off any excess sugar and leave to dry overnight on a baking tray lined with parchment.